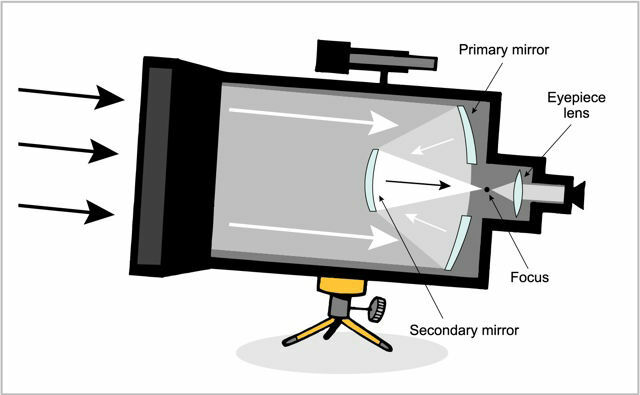 In contrast to a refracting telescope, which uses lenses to enlarge images, reflecting telescopes (also known as reflectors) use mirrors to accomplish the same goal. 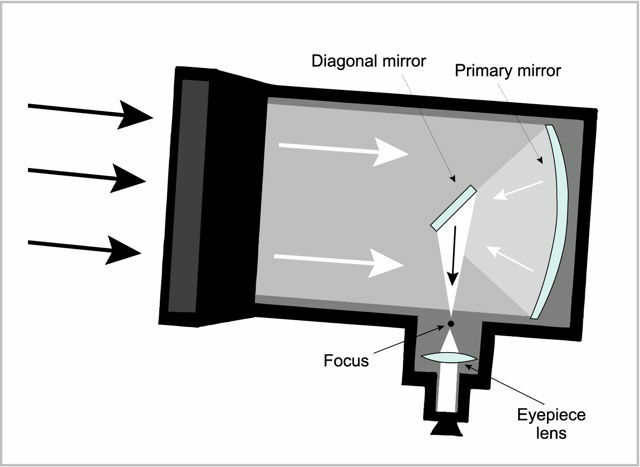 The advantages are numerous: manufacturing mirrors is simpler and less costly than lenses, there are less aberration-related problems, and the main mirror can be supported from below. Today, the reflecting telescope is considered as one of the most powerful scientific instruments ever invented. Sometime between 1540 and 1553, the English mathematician Leonard Digges constructed the first reflecting telescope using a mirror and a lens. In 1576, his son Thomas, an astronomer, used it to defend the idea that the Universe is infinite, which was a revolutionary concept at the time. Nevertheless, it would be another 100 years before the reflecting telescope was widely used. In 1663, the Scottish mathematician and astronomer James Gregory published his book Optima Promota in which he included the design for a new type of compact reflecting telescope. The English physicist Robert Hooke built the actual instrument several years later, only a short time before Isaac Newton developed his own telescope in 1668. 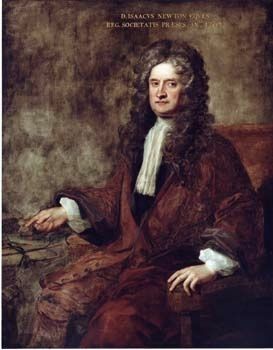 The principle behind Newton’s telescope was so simple that we still use it today. It consists of two mirrors: the primary and the secondary. 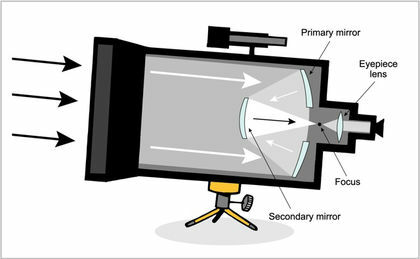 The primary mirror has a parabolic shape and serves to collect light from the object of interest. The secondary mirror, smaller than the primary, is flat and inclined in such a way as to reflect light from the primary mirror towards the ocular and the observer. 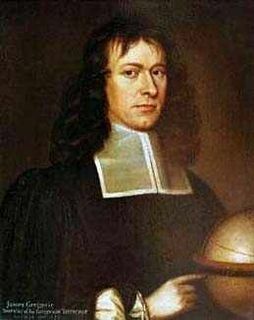 In 1672, the Catholic priest and French teacher Laurent Cassegrain invented a new type of reflecting telescope that he described in an unpublished manuscript. The Cassegrain telescope consisted of a primary parabolic mirror, which collected light from the celestial object, and a secondary mirror, which faced the primary mirror and concentrated the reflected light towards the observer by directing it through a hole in the centre of the primary mirror. The image could therefore be viewed from behind the telescope, and not from the side, as with Newton’s design. The big advantage to the Cassegrain design is its compact size, which makes it portable. Moreover, heavy instruments can be installed at its based. Today, the Cassegrain reflector is the most commonly used type of telescope. John Barrie Hutchings explains what a refractor is. A refractor is the name for a telescope that uses a lens as its main optical component. The earliest telescopes were refractors. They were made of glass lenses, and refractors were how telescopes were made until they became so big that it was impossible to support such a large weight of glass as the primary lens aperture of the telescope, at which point the design moved towards the reflecting telescope because it was easier to engineer. So, refractors are telescopes that use lenses and not mirrors.